The Housing Preservation practice is designed to protect families from illegal evictions, including eviction after foreclosure; substandard housing conditions; and wrongful denials and terminations of housing subsidies. The practice also works to preserve and expand affordable housing and protect families from foreclosure rescue scams. BayLegal serves as the Bay Area’s leading provider of legal aid to individuals facing discrimination in housing. BayLegal’s commitment to enforcing federal fair housing laws is at the center of the practice. BayLegal represents people discriminated against in housing on the basis of race, ethnicity, national origin, gender, disability, sexual orientation, family status or other protected classes. Each year BayLegal helps low-income tenants obtain or remain in safe, affordable housing. Are you being evicted or facing foreclosure? Do you need help with Section 8, subsidized, or public housing? Are you experiencing housing discrimination, poor housing conditions, lock-outs, or utility shut-offs? 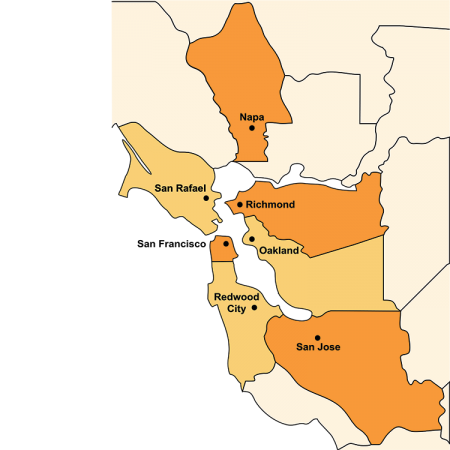 Bay Area Legal Aid’s Tenant’s Rights Line provides legal assistance to Alameda County residents only. We cannot guarantee that an attorney will represent you in your case, but we will provide advice and referrals to individuals who qualify for our services. Residents of other counties: please call the Legal Advice Line. Bay Area Legal Aid provides monthly Know Your Rights training throughout Alameda County.